I had a recent business trip to Milwaukee scheduled, so I decided to go early and search Milwaukee for some German style sausages for an Oktoberfest party I am going to this weekend. I wanted brats for sure, but I was looking for other breeds of sausage to take with me and figured that Milwaukee, with its German and beer drinking heritage would be the place to go. My first stop was the Milwaukee Public Market. The market was quite a bit smaller than I imagined, and very little there really caught my eye. Although it's a nice year round venue, the vendors were uninspiring. There was very little sausage being sold beyond the cliché brats in multi-flavors. I bought some mustard, but nothing else. My next stop was Jake’s Delicatessen for a quick lunch. Jake’s reminds me of the Milwaukee version of Moon’s Sandwich Shop, albeit with a much smaller, laser focused menu. The corned beef was as good as ever. As someone recently pointed out, the slices of corned beef were cut a bit thicker than I remembered, but tasted just as good. The rye bread was soft and fresh, but substantial enough to stand up to the corned beef. 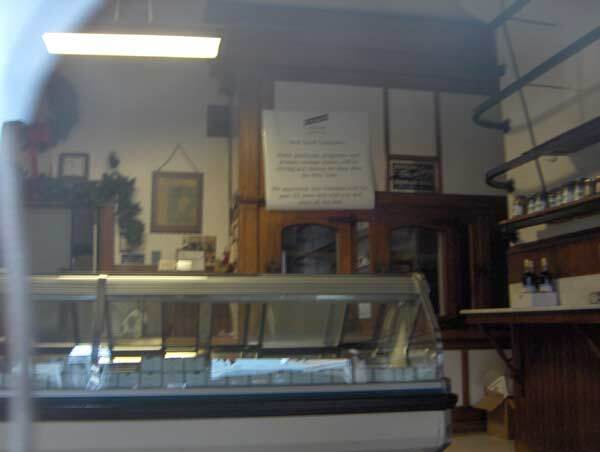 After a detour to Waukesha for my business meeting and a custard break at Kopp’s in Brookfield, I headed back into town to track down European Homemade Sausage Shop, which came highly recommended by GWiv’s Uncle Jerry. European Homemade Sausage was exactly the kind of place I was looking for. 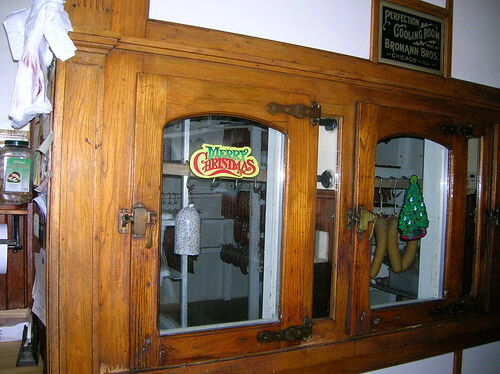 It’s a little shop on the first floor of a house in a completely residential neighborhood. It’s a holdover from the pre-supermarket days when shops like this dotted every neighborhood (butcher, baker, candlestick maker). 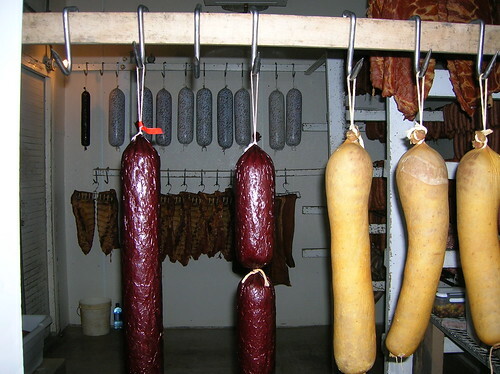 Most of the sausages and bacon are handmade in the back room of the shop. I got there right at closing (they close at 4:00 P.M.), so the selection was a bit depleted, and the recommended knockwursts and several types of distinctly German sausages were sold out. A new batch was being made, but wouldn’t be ready until the next day, so I had to make do without. The lovely woman who waited on me was very nice, but exuded a distinct “tell me what you want and get the hell out of here, we’re trying to close” vibe. I ordered quickly, but might have missed a couple of gems, since I was trying to hurry. By the time I left and walked across the street to take a picture, she had already pulled down the shades and put the “closed” sign in the door (see above picture). I wish I had gotten there earlier and had time to ponder the vast selection which included a number of larger hanging salamis and other sausages held in a wooden cooler behind the counter. Even without the knockwurst, I still hit a bonanza. I bought some brats, Hungarian & Polish sausage, ring bologna, hunter sausage (landjaeger), a pound of some really delicious, sliced to order bacon and a couple loaves of some very dense handmade rye bread. On the way home, I made a stop at Bobby Nelson’s to round out the brat selection a bit with The Chow Poodle’s favorite Cajun brats. stevez wrote: I had a recent business trip to Milwaukee scheduled, so I decided to go early and search Milwaukee for some German style sausages for an Oktoberfest party I am going to this weekend. Milwaukee Public Market, Jake's, Kopp's, European Homemade and Bobby Nelson's, now that's a business trip! Glad Uncle Jerry came through for you, the man knows his way around a sausage. He and my Aunt Gail are the go-to resource in Milwaukee. I'll be in Milwaukee next week, looks like a stop at European Homemade Sausage Shop is in order. Wow, this place is great! Thanks to Steve, Gary, and of course Uncle Jerry for mentioning European Homemade Sausage. I'd say it compares favorably with the best in Chicago. It's been around only thirty-some years but seems from a different era. They must have taken over a much older business. stevez wrote: I ordered quickly, but might have missed a couple of gems, since I was trying to hurry. You missed the Bolshevik! Understandable, since it wasn't labeled as such, a story in itself. I missed the bread when I was there. Do you remember where it was from? Even though you didn't get any knackwurst (plump beauties! ), your picture shows they had much of their stock. Rene G wrote: Wow, this place is great! 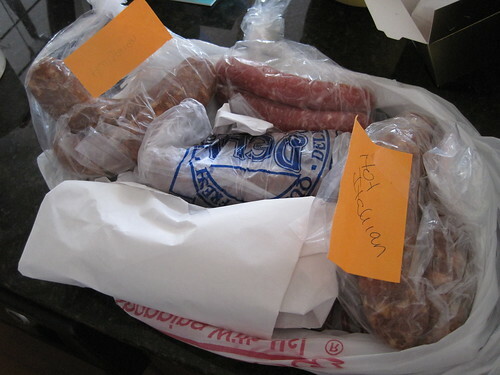 Thanks to Steve, Gary, and of course Uncle Jerry for mentioning European Homemade Sausage. Ditto (especially Uncle Jerry...gotta love a food/restaurant source who's affectionately known as "Uncle Jerry"). This place oozes Old World personality and professionalism. I bought half the things they offered since it looked and smelled so amazing in there. Had some of their fresh liver sausage last night and couldn't stop eating it. Quite a bit mellower than your run-of-the-mill stuff but much more enjoyable. Sensational shop. I can see making it a usual stop whenever I'm up there... just on soul alone. While perusing EHSS yesterday afternoon, we got to conversing with a customer who was kind enough to make another unique recommendation for Milwaukee, Northern Chocolate on N. M. L. King Drive. While we didn't have sufficient time to follow up on this reco., I thought I'd mention it here for anyone else who might also be interested. A quick Google search turned up an interesting article about this establishment and its kooky owner. Jake's should now be added to the list of establishments where one stands a good chance of running into fellow LTHers. EHSS (brats+knackwurst+liver sausage+ ham+ bacon) + Jake's (hand carved corned beef) + Milwaukee Museum of Art (Biedermeier) + Zaffiro's (cracker-crust pizza). With the exception of the third, thanks to LTH for all the recs. Fresh Slovenian Sausage : Finely-ground, lean and mild pork sausage with a pronounced nutmeg flavour. Too much so, in my opinion. Krakowska (Unsmoked) : This was described by the counterwoman as being "very lean," and "ham-like." 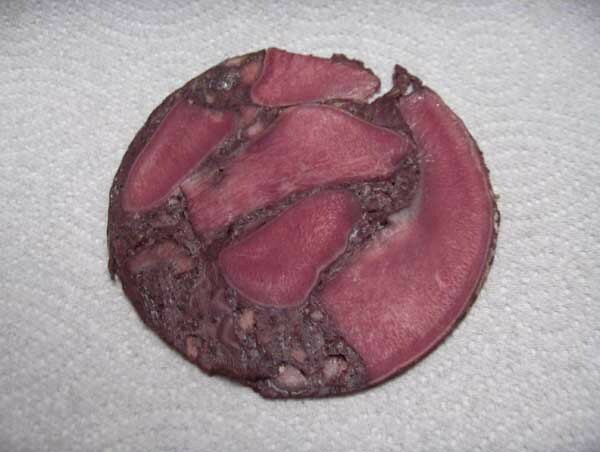 A very mild, semi-dried, "summer" sausage. I enjoyed it best thinly sliced on rye toasts with a crème fraîche/grated fresh horseradish/lemon juice combo. Hickory Smoked Bacon : Nice fat-to-meat ratio (read: fatty) and nice texture, but I found the smoke a bit crude. Then again, after trying extramsg's homemade smoked pastrami last week, I've become spoiled for a good smoke. Lakeside's brand "Hot German Dusseldorf Mustard" : Fantastic. Vinegary and almost "creamy," with a clean, fresh horseradish hit and minimal sweetness. steve z wrote: European Homemade Sausage was exactly the kind of place I was looking for. European Homemade Sausage is a unique experience the feeling of step out of time so complete one almost believes in time travel. A solitary sausage maker quietly working his craft while a single counter person handled the thin, but steady, stream of customers. Frank remained in the back as I chatted with Bonita, she said her father named her, as she sliced and packaged my ever expanding list of purchases, though mention of the internet and Uncle Jerry provided momentum to converse. It's seems the internet people left a lasting, and positive, impression on Frank. I was kindly let in back to snap a picture or seven, including rows of sausage smoking. The picture appears diffused as smoke billowed out the moment he opened the door. Tubs of pig snout and tongue cooled, eventually destined for sausage, though short term they were Frank's lunch. He asked if I had ever tried pig tongue or snout and seemed mildly surprised when I, not only answered in the affirmative, but seemed enthused at offered sample of same. Final destinations of cooling tongue and snout. Rene G wrote: I missed the bread when I was there. Do you remember where it was from? Frank mentioned the bread was from Canada. Unique to me was cayenne laced summer sausage. Born and raised in Milwaukee I was familiar with 'mit or mit out' (garlic or no garlic) but had never encountered spicy cayenne summer sausage. Being a fan of both summer sausage and spicy I found it delicious and wished I had bought an entire sausage instead of a small piece. Thanks to Uncle Jerry and Steve along with Pigmon and Erik's follow-up I had, coupled with Erik's lead of Northern Chocolate, a very fruitful LTH day in Milwaukee. Stopped by European Homemade Sausage just before their scheduled closing at 4 pm. The Christmas tree and decorations were still up suggesting it hadn't just closed in the last few minutes. 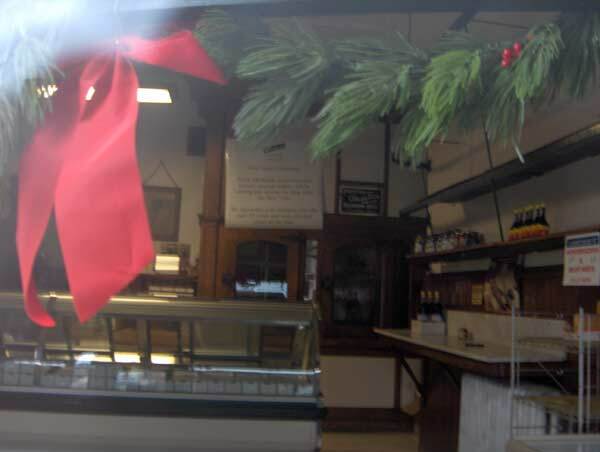 Frank Jakubczak, proprietor and primary sausage maker, will be retiring and closing the shop after the New Year. We appreciate your business over the past 35 years and wish you and yours all the best. stevez wrote: That is heartbreaking news. According to Uncle Jerry European Homemade Sausage is now open 3 days a week, though he was not clear which three days. It seems Frank tired of retirement and decided to reopen the sausage shop. G Wiv wrote: According to Uncle Jerry European Homemade Sausage is now open 3 days a week, though he was not clear which three days. It seems Frank tired of retirement and decided to reopen the sausage shop. Great news! It turns out Frank retired only a few months. A very nice article from the Journal-Sentinal can be found here (it includes a beautiful picture taken inside the Bromann Bros Perfection Cooling Room). I got a laugh from one of the comments on the article: "The Brett Favre of the sausage world!" We stopped by on Saturday, a little before 5pm. Unfortunately we missed the bolshevik by about an hour. The shop is open only Thursday through Saturday from 8am to 4pm. It's nice to know it will be there for my next visit. My name is Mary and I am Frank Jakubczak's daughter and new chief operation manager of EHSS. I stumbled upon this blog and couldnt be more excited and grateful for the praise and support for his store. As noted, Frank did try to retire and based on popular demand (and riot---kidding) he was forced to reopen for Easter. What really happen was the sale of the business fell through, and each day he went to the store to take care of odds and ends he found hundreds of people calling on his caller ID. He made the decision to reopen. After some consultation and debate with the family, he not only opened for Easter, but is now available weekly Thurs-Sat. To both myself and my brother Andy, we found this to be an eye-opening string of events, and have decided to take it a step further. Our intentions are to take over the business and have it around for years to come. For starters, keep an eye on our new website and social media outlets for any updates and shipping information. Obviously Dad has mastered the sausage-making, but its our job to get it to the people who most appreciate great homemade sausage made "the old world way"
MaryD wrote: Our intentions are to take over the business and have it around for years to come. This is wonderful news! Good luck to you and your brother. I hope one of you is learning Frank's recipes and techniques so the shop can keep going well into the future. Ditto. I'll be in on Saturday! And thanks for the Twitter follow. What a difference a year makes. Last year, I could only dream what European Homemade Sausage may taste like as a I read his retirement announcement. This could be considered art! I bought two links of this Polish sausage for Mom2. This Polish sausage was simmered, then served with boiled potatoes and beets grated into horseradish. Mom2 said it was one of the best Polish sausage she's eaten. While we were tasting sausages, a fireman walked in to make a substantial purchased. While I was sorry they retired last year before trying. This guy was distraught, because it was his favorite go-to place. I really do hope Frank's kids are learning this craft. This is probably the best thread I've seen on LTH Forum so far. Wow! I've been to Milwaukee many times and I've never even heard of European Sausage. (Although I do love Kopps, also mentioned in the thread). I usually drive through a few times each summer. I'll make a point to stop in and pick up some product when I have a chance. Wow, I'm glad Frank came back out of retirement. And I agree with Cathy2, his kids should learn the "art" of sausage making. It's been a while since I made the trip up from Gurnee (not that far really) for some fresh Slovenian sausage. I'll be making the trip soon for sure. I stopped by over the weekend and thought the place was good and cheap, but not particularly special. I tried three of the smoked sausages and thought they were fine, but no better than what I can get at Gene's. That's not a knock on the place, but I'll use future dining time in Milwaukee to eat food that can't be had within a mile of my house. The Blood 'n Tongue is pretty but I thought that was about all it had going for it. Neither the texture nor the flavor did much for me, but I've yet to love a blood sausage so take my dislike of this iteration very lightly. Kitty-corner from sausage shop is a new taco stand. According to the folks in the shop, there's a line at the stand every day. Nobody was waiting when we stopped by but that probably had something to do with the 20-degree weather and the snow. I was more than a little excited to see the tortillas were pressed to order. Because it was a slow day, my barbacoa had to brought out from inside. It clearly was not all that fresh, but the flavor was good and the meat was pretty tender. The taco didn't rock my world, but it was definitely $1.50 well spent and I'd happily return on a warmer day. Finnaly made it to European Homemade lst Friday. Ready to eat very nice. The fresh Polish tasted like Brtawurst with Garlic and was probably the best Brat I have ever eaten. I purchasedBrat sized links that I was told was Polish but I wonder if they got mixed up? They tasted so good t ha I have to call on Thursday and ask if they use MSG! We have smoked to go which will be in Kraut. I have mentioned this place in other threads, but International Foods in Shorewood, WI on Capital is great for hard sausage. exvaxman wrote: I have mentioned this place in other threads, but International Foods in Shorewood, WI on Capital is great for hard sausage. Do they make their own sausage? for what I like, they do not make their own. For many other foods, it is a toss-off. My elderly neighbor was brought in and now swears by them for the NY imports and the local food. The hard sausage that I like is an "import" from a russian style manufacturer in Tenn. Does anyone have any other small-scale Milwaukee area sausage makers they would suggest? Especially if they make Italians, Slovenians, and Hungarians that are even remotely comparable to Frank's? The previously mentioned International Foods also appears to be permanently closed. Yes, we miss Frank. There was also another place like that called Pumekles in West Allis that is now gone. Brought tears to my eyes. A couple of places to try are as follows. 1) American European Foods, 5625 W. North Ave. - Croatian place with great sausage including Cevapcici. 2) Karl's Country Market on corner of Silver Spring and Pilgrim. Great butcher shop and tremendous home-made sausages (all that you described). 3) House of Homemade Sausage on Mequon Road in Germantown. Good family owned place. 4) Sausage Haus in Oconomowoc. Home-made sausage variety and very solid. 5) Glorioso's on Brady for Italian Sausage. Excellent. 6) Scardina on Chambers for Italian Sausage. +1 on House of Home Made Sausage in Germantown. They do a nice job with Italian and Hungarian sausages. Many other great ones, including summer sausage and meat sticks. Well worth the ten-mile drive from downtown Milwaukee. "Does anyone have any other small-scale Milwaukee area sausage makers they would suggest? Especially if they make Italians, Slovenians, and Hungarians that are even remotely comparable to Frank's? " To answer your query succinctly, NO!